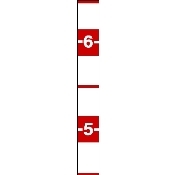 HEIGHT MARK TAPESTRIP(c) is a copyrighted measurement tape, printed on pressure sensitive vinyl stock, and used to identify the approximate height of persons entering or exiting through a doorway. It is typically used in connection with closed circuit TV monitoring and video recording. Can be used anywhere knowing the approximate height of persons may be useful in identification. Each strip is 1 inch wide by 24 inches in length, with bright red height markings from 4 1/2 to 6 1/2 feet. TAPESTRIPS are for indoor use only. No tools or adhesives are necessary for mounting provided the surface is clean, dry and smooth. Two tapes are recommended for each standard size doorway. Priced Each.